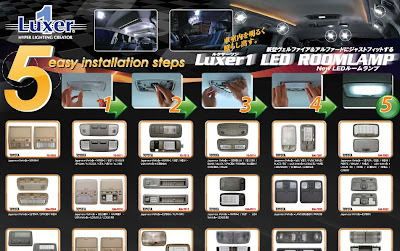 Greatly to introduce you our new line product from SUN Automobile. HotInazma Pocket Super is a newer and enhanced version of its predecessor HotInazma Pocket. With HotInazma Pocket Super, it helps you realize your vehicle full potential more than HotInazma Pocket. The function of reducing the electrical loads is greatly improved. It also deodorizes and provides relaxing effect by releasing negative ions. Thus, it reduces unwanted odors in your vehicle. This second generation HotInazma Pocket Super provides all features that HotInazma Pocket does. HotInazma Pocket Super comes in Golden color. This device is specialized for 12v car system that easily attached in the standard cigar socket. You can send your enquiries via Contact Us or email info@tjm.com.my. Besides you may visit our office situated at Old Klang Road as illustrated on the map. 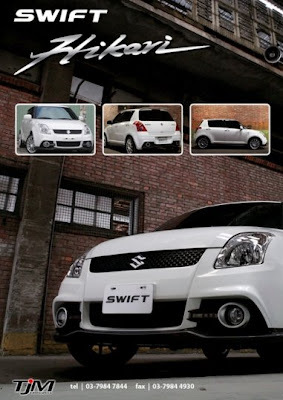 Introduce you a new outlook for your premium car - SUZUKI SWIFT - . With Swift Hikari GT Style full bumper body kit, shift your SWIFT up that different from the other. Keep you outstanding and elegant. Quickly grab yours first in Malaysia from TJM Products with a great intro price offer RM 3000 per set only, as it is currently a new product that we bring in now. The body kit original developed by Suzuki Taiwan, genuine kit and not an imitation. Let your SWIFT be the first with this nice & eye-catching look new body kit. Contact us for Auto21 SWIFT Body Kit. .
Memperkenalkan gaya baru untuk kereta kesayangan anda - SUZUKI SWIFT - . Dengan body kit Swift Hikari GT, sudah pasti SWIFT anda kelihatan anggun lagi bergaya. Segera dapatkan dan jadikan Suzuki Swift anda yang pertama di Malaysia dengan body kit Swift Hikari. Sebarang pertanyaan, hubungi kami TJM Products di rangkaian Contact Us. Untuk pembelian, setiap set berharga RM3000 sahaja. Set bumper ori dari Suzuki Taiwan, jamin genuine dan bukan salinan tiruan. Milikinya sekarang dan jadikanlah SWIFT anda idol di kalangan ramai. * Price nego. More discount for Group Purchase (more than 1 person). Ring us for price details.